BACK WHEN I was an aspiring pro, I was starving for ways to improve and learn as much as possible about the game. My coach, Harvey Mason, was a great influence on me during this time in my career. I can still remember the day I showed up for practice a little late. Not even my father screamed at me like that. But it was great for me; I knew he really cared about me and truly believed in me. In addition to teaching me a lesson on the importance of punctuality, Harvey showed me this drill, which is great to hone your shot-making abilities. 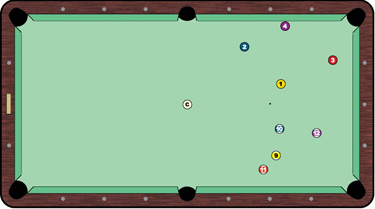 As you can see in Diagram 1, the cue ball is placed on the center spot. Spread four balls out on the right side of the table and four balls on the left. They can be anywhere on one side of the table, as long as each ball has a direct path to the corner pocket. Start by pocketing all four solids into pocket A using only draw. Don't worry about where the cue ball goes; this is a drill specifically targeted at pocketing balls. Next, go to work on the four stripes going into pocket B. When you can consistently pocket all eight balls without missing, repeat the drill - but this time use stun. Hit each shot so that the cue ball arrives at the object ball with no spin (which means your contact point will depend on the shot speed and the distance between cue ball and object ball). When you have mastered this exercise using stun (mastered meaning a success rate of 90 percent or so), now it's time to use follow. Again, pocket each group of balls in its respective pocket. If you can handle these three sets of shots, move the cue ball one diamond back from the center spot (keeping it on the center string). The extra distance and tougher angle on thin cuts (the 3 and 12 balls, for example) will further refine your shot-making skills. Many players tend to become one-dimensional, because they are strong with draw but weak with follow (or vice-versa). Think of a basketball player who can only go to his right. That's a pretty big limitation. Well, the same can be true in pool. This simple practice technique will help make you a multi-dimensional threat. You'll be confident and comfortable, no matter where you have to hit the cue ball on its vertical axis.